Sometimes you have a craving for something different—spicy, or sour, or never-before-tasted. Sometimes you crave something—not familiar or bland or comforting per se—but the platonic ideal of a category which brings you pleasure. An exquisite slice of pizza. That turkey sandwich this one place near you makes, with just the right bread, and a sriracho-mayo spread. The first sip of a Coke. The bit of a burrito where the ratio of rice-beans-sauce-cheese is symphonic. And media is no different. Sometimes it simply must be Friends. Or, in spite of yourself, you feel a deep yearning to spend a couple hours in Woody Allen’s New York. Or only the vibrancy of Almodovar will do. This is how reading The Great Believers felt: It is a perfect novel. Perfectly a novel. Are you craving something clean but sophisticated, artistic but accessible, contemporary in content while still classical in form? 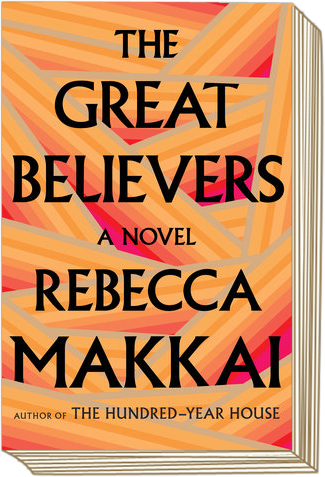 Rebecca Makai’s satisfyingly hefty (but not heavy) book is your next read. It is not the box of mac’n’cheese, it is the bowl of spaghetti with fresh-grated parmesan on top. In two parallel timelines, it follows a group of young gay men living through the AIDS crisis in Chicago in the 1980s, and then the present-day life of a woman whose brother was among the first of those friends to die. It is not a “sad book,” though it is wrought from tragedy. It is gorgeous and emotionally honest but never melodramatic. The main characters of each timeline, Yale and Fiona, are winning, as is the city of Chicago. And for readers like me who were removed enough and/or too young to have a real awareness or understanding of what was going on during those years, it recreates the lived experience of a singularly exuberant and devastating moment in time. This has the effect of un-flattening our known, retrospective grasp of history and reminding us of how disasters are lived in forward-moving time: with a million questions, with surprise, with love and fear. With lots of hope for the unknown and unknowable future.